What Do You Mean My Kids Won’t Be The Same?! No dad, we aren’t the same. You have one kid, go through all the ups and downs in their time as a baby, into toddler-hood, and beyond. They learn at their own pace, as do you. You become accustom to how you did things with them. How they slept. How they ate. How they reacted to being sick. How they interacted. Their general disposition. And in your mind, you think “when we have a second kid, it will be just like this all over again”. Totally logical line of thinking. Wait, what?! What’s that old saying? 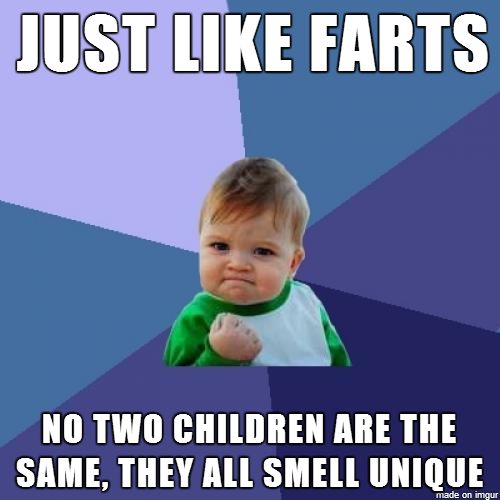 “Just like farts, no two children are the same. They all smell unique.” That’s it, right? No? Oh, right, it’s “children are like snowflakes, each one is unique and no two are the same.” Well, it’s true. Unless maybe if we’re talking about twins, but they’ll be unique in personality, so I guess it still holds true. Anyway, back to my point. Because I had one. Seriously, I did. When Maddie was born, the hope was that we could get her into a sleeping pattern quickly, much the same way we did with Sophia. Sophia got started sleeping through the night relatively quickly as a baby. Maddie did not. She had reflux, which caused sleeping issues. It got to a point that she could only sleep with us, which wasn’t ideal. Eventually it subsided and now she’s a great sleeper (SELF-FIVE!). Eating? Sophia has always been a picky eater and doesn’t tend to gain a lot of weight. Maddie, on the other hand, will eat pretty much anything. Except for veggies, she is NOT a fan of veggies, yet. Both the girls have very pleasant dispositions. They both love to laugh, which makes for a lot of laughter around our house. That’s the best part of being a parent–laughing at–I mean with your kids. Save for the tantrums that I wrote about earlier this week, laughter fills our house. 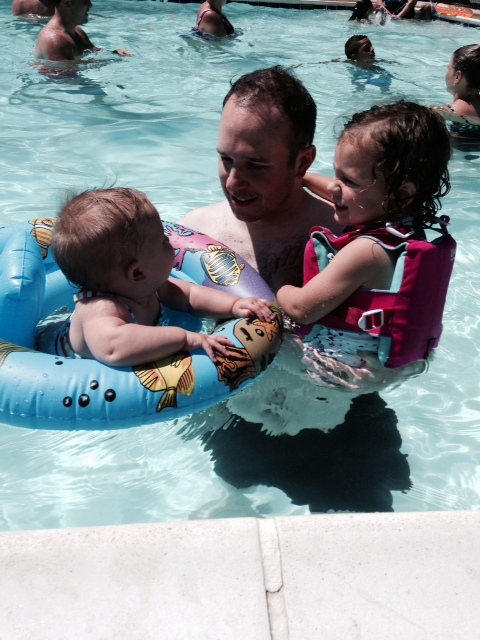 Both Sarah and I love to laugh and tell jokes, so it’s fitting that we have kids who love to do the same thing. When it comes to being mobile, Sophia crawled, stood, and started walking much earlier than Maddie. She was crawling by 6-months, took her first steps at 10-months and was walking by the time she was one. Maddie started crawling just around the 9-month mark and is pulling herself to a stand now, at 11-months. I’m sure the walking and standing on her own will be coming in short order. It’s just interesting to me that after you have your first kid, you tend to have a set of expectations for the second for how they will develop. If the first kid was quick, you think the second will follow suit. It’s not how it works. Unreal expectations, I suppose. No matter how much people say you don’t compare your children, guess what? You’re always going to. I remember being compared to my brother and sisters growing up, by my parents. And I know that it’s going to continue throughout their lives. If we have more children, I’m sure that I’ll make comparisons to Sophia and Maddie. It’s just how it’ll be. I wanna know what your experiences have been like with the development of your own kids. The same, different, otherwise? Share with the class here, on Facebook, and Twitter! They do show their individuality right from the get go don’t they! It keeps us parents from thinking we got this thing covered. Haha you’re right! The minute we think we have a handle on things, they show us we don’t. Not to compare your kids to my dogs but I thought that owning the second set of dogs that it would be just as easy as owning my first set of dogs except for just like you said I guess I had unreal expectations. We got these puppies living in a different scenario, and my second set of dogs are giving me a run for my money and I compare the two (first set of dogs to second) often. I know it’s not kids, but the idealism behind it is similar. Thanks Robert. It’s funny you bring up the dog comparison. Before we had our first daughter my wife wanted a baby or a second puppy. We went the puppy route. He joined the dog we had for years and training them was completely different. And much more difficult the second time around!